After some fierce rain and storm the streets are lined with broken umbrellas. 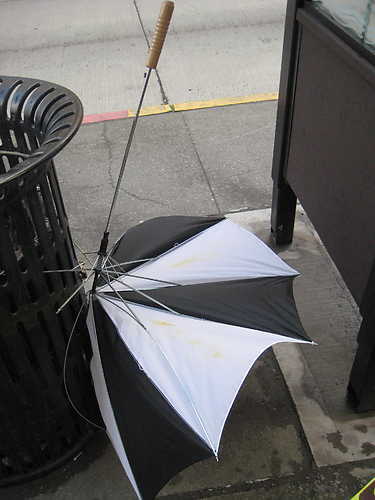 Carelessly shoved into waste bins or inconsiderately dumped in the gutter: these days umbrellas are granted only a short life. Did you used to hand down an umbrella to your children in the old days, now you buy a folding number that lasts for one downpour. But an umbrella is not a disposable item perse and actually can be repaired. This used to be a very normal thing to do and in countries like India there are still numerous repairmen that know what to do with a folded back umbrella. In the Netherlands there are only few of these people left, like Roger Hänschen who has his work studio in his shop Huckriede in Enschede (find his contact information in our Repair HUB). The artisan skills that come with repairing umbrellas are slowly disappearing. At reparapluie you can see how it’s done. Of course prevention never hurts, so here is a tip from the pros: Watch out when you turn a corner. 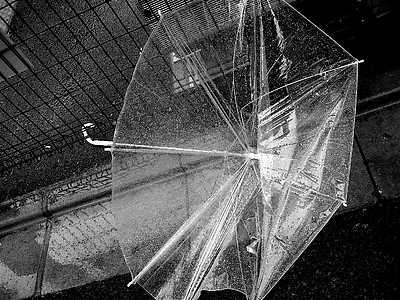 The tric is not to stick the umbrella to far forward and to slightly steer it around the corner, so that the wind cannot catch underneath. Want to do some repairing yourself? www.howtodothings.com/family-and-relationships/a4487-how-to-repair-an-umbrella.html gives extensive discriptions of different umbrella repairs, while www.burdastyle.com/howtos/show/1762 shows you how to do it step by step with an instructable.